What They Say.....After years of watching her best friends Ben and Claire try for a baby, Romily has offered to give them the one thing that they want most. 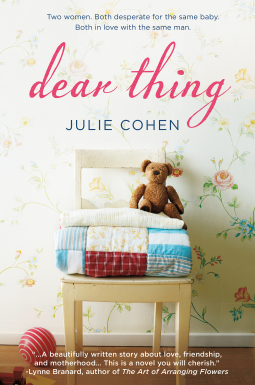 Thought-provoking, heart-rending but ultimately uplifting, Dear Thing is a book you won't be able to put down, until you pass it on to your best friends. What I Say.....This book is one of the reasons that I love blogging. This is a book that I would have missed, and that would have been a shame. Romily is a single mom, definitely not living the dream, but has hung on to her best friend Ben throughout the years. She's in love with him, although he seems not to realize it. I don't know how sure I am of this, as much as Ben was a good guy, he also seemed to have the need to be perceived as the perfect guy to everyone, his wife, his best friend, his in-laws. When Ben and Claire find that they aren't going to be able to have children, Romily makes a drink inspired offer to be their surrogate. After a tiny bit of thinking (seriously, the time it took to decide this was minuscule), we find Romily with her legs up a wall and a syringe of sperm in Ben and Claire's spare bedroom inseminating herself (seriously, gross). That's when the real fun begins. Romily has a very uncomfortable pregnancy, St. Claire is fighting off her normal feelings of jealousy, and Ben is smiling over everyone, oblivious to the undercurrent. I think the real story for me was the development of Romily and Claire's understanding of each other, even when Claire discovers that Romily is in love with her husband. In the middle of this Romily's ex pops back into her life, and finds out that she chose to have the baby they conceived 7 years ago. So many different people, so many different agendas. And in the middle, both a new baby and the child that Romily has raised.